We specialise in the complicated array of academic and forensic investigation procedures that are required in preparing any case to be presented for consideration concerning the authenticity and legitimacy of the works of the French artist, Paul Gauguin. We are expert in conducting professional investigations for clients from all around the world, including both private individuals and institutions. Anyone who is concerned that a work which they believe is by Paul Gauguin, or one that bears a Paul Gauguin signature may or may not be legitimate. Working from our strategically sited bases in Europe, a geographic 'needs must', and imperative in accessing archives, enables us to conduct complicated and detailed investigations and research. Navigate to the Authentication and Profile pages of the site for more information or Contact us directly for help and advisory when it comes to Paul Gauguin authentication issues. Paul Gauguin Art Authentication. Before you begin. * Before entering into a full investigation of the legitimacy of a work of art believed to be by Paul Gauguin, be it academic, forensic or as with most cases, both, it is essential to know if the project is at all viable and even vaguely possible to prove. It's much as you would need to know if you were taking a legal case to court and it is just as important. Logically, if it is not viable to pursue, you should not attempt it as the risk of failure is too high. So here at Freemanart, we prefer to make a preliminary and vital professional pre authentication assessment for clients first. Based upon the images you supply, the full details and the work of art's history and provenance as it is known. This is a logical & cost effective professional assessment and advisory for which there is a modest set fee. Please see our >FAQ's < here, which explains the process in detail. Until well after his death, the French artist Eugène Henri Paul Gauguin was a very much under appreciated French post impressionist artist. Were it not for his art dealer and representative Ambroise Vollard, his posthumous success would never have been so grand. However it certainly turned out that way. His paintings of Brittany and the French countryside are today not as prominent in the eye of the beholder of what he is most recognised for. His Tahitian subjects and native Tahiti women dressed in alluring and brightly coloured costumes set in a tropical paradise. The Freemanart Consultancy have seen hundreds of claimed to be Gauguin's over the years and still do so and have been involved with uncovering and investigating some of the biggest Gauguin art fraud and fake art attempts and scams in modern times. Not only was Gauguin a painter, but also a sculptor, print maker and ceramicists. It is not surprising then that many fake prints, sculptures and works made in pottery, also turn up on the Freemanart investigation schedule and far, far too regularly. Authenticating Paul Gauguin's works of art including those paintings and drawings which claim to have been created by the innovative 19th century French artist Paul Emile Gauguin, falls to the art worlds experts such as Freemanart. Their Executive Director David Freeman was responsible for compiling the important GAUGIN INDEX and has worked on some of the biggest Gauguin authentication cases in recent years. He has also investigated and assisted in the prosecution of many of the biggest Gauguin art frauds and criminal cases too. Freemanart are specialist art experts working specifically in the field of art authenticity & art authentication investigations. But as each year passes, more and more fake Paul Gauguin paintings and faux drawings and prints appear on the art market and we get busier. Freemanart specialise internationally with the investigation of and into the authenticity of the works of Paul Gauguin including; Gauguin's oil paintings, Paul Gaugin's water colours, drawings and Gauguin's graphic art, ceramic ware and three dimensional, sculptural works of art. There follows one recent case study. 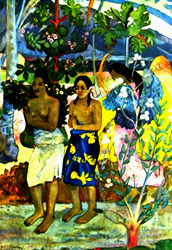 Paul Gauguin's artistic career spanned six decades and his art output during his Tahitian period particularly which was spurred on by the voracious demand for saleable product by his French patron Ambroise Vollard, the leading Parisian art dealer of the early twentieth century and the main career mentor behind Cezanne, Picasso and Maillol, was even for Paul Gauguin, very demanding. But not as demanding as proving as authentic or of disproving the authenticity of works claimed to be by Gauguin or attributed Paul Gauguin art works, which is for the authenticators of today's newly discovered Paul Gauguin oil paintings, watercolours and drawings a complicated task. Authenticating Gauguin and his art is sometimes much more difficult than in this simple and most recent case undertaken by the Freemanart Consultancy who specialize in art authentication matters and art authentication investigations internationally. 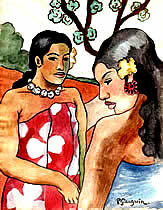 This was a so called Paul Gauguin water colour depicting two Tahitian women signed unmistakably bottom right, Paul Gauguin. < Now, if ever this painting had any chance to be an authentic Paul Gauguin watercolour, then obviously it would have originated from within Gauguin's creative period somewhere between 1890 and 1900. That's when Paul Gauguin was working and living in the Polynesian islands of Tahiti. The number of paintings Paul Gauguin painted of Tahitian girls wearing the red floral Ti are motif on a sarong, is indeed more than many and whilst on first inspection it is easy for some to say that for Paul Gauguin, this painting is just not good enough to be by him, there are times when art authentication experts have to ' absolutely prove ' the issue of authenticity either way. A Gauguin fake it may be but perhaps it could be an authentic work by Gauguin? So let's look at why this Paul Gauguin water colour on the left is not and cannot possibly be by Paul Gauguin. Interestingly, a lot of information comes from an inspection of the back of the picture, applying some simple logic and a slightly deeper more forensic approach into a Gauguin fake. > On the right, the paper on which we are lead to believe Paul Gauguin painted these two Tahitian women above is executed on Ingres paper. Ingres paper has a definitive pattern of lines as you can see, created in its manufacturing process, seen on the right. Artists the world over and including Paul Gauguin himself have chosen and used Ingres paper by preference, certainly for drawing on but seldom for painting. Particularly not with watercolour as Ingres paper is too absorbent and can buckle easily. So what else does the back of the fake Gaugins & its paper tell us? Look at the bottom right corner in the image to the right. It's trimmed and rounded as were the other three and there is discolouration from the edges of the page seeping towards the middle too. Dirty marks which go all the way around. 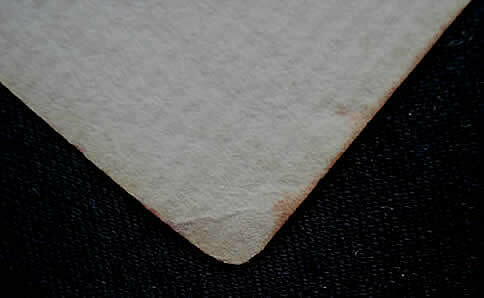 ^ Cut rounded corner of the fake Paul Gauguin fake watercolour painting's paper. < Detail of Paul Gauguin fake watercolour. 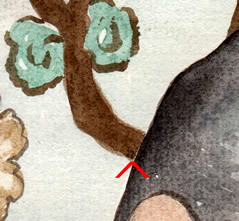 < Where the red arrow points on the Fake Gauguin watercolour painting to the left, is a thicker area of paint or 'impasto' in which some residue and in particular, paint brush hairs were embedded. 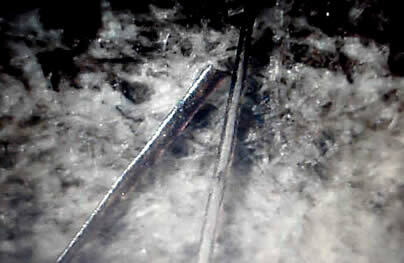 Upon further inspection under the microscope, some interesting features can be noted! Synthetic, smooth surfaced filaments, as photographed in the purported Paul Gauguin fake painting above and used in paintbrushes, are produced by extrusion. Thus giving them the regular, tubular & glassy appearance and not the 'thick to thin' and 'scaly' form of a natural animal hair, such as the preferred artists brush made from sable. Much like those below. Acrylic is also a product of the sixties and not the 1860's but the 1960's so our friend Mr. Gauguin could not have possibly painted this picture even on a bad day . He died sixty years earlier than it's invention. 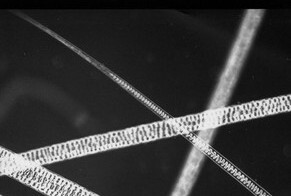 Below: Microscopic imaging of sable brush hairs. 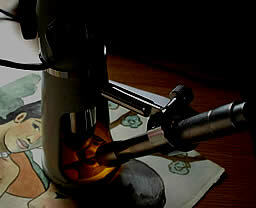 Microscopic imaging of sable paint brush hairs not evident in the Paul Gauguin fake painting we examined. Clearly the Paul Gauguin painting we investigated and discussed on this page was not by Paul Gauguin himself. Which right from the start was evident to us and will also be to many of you. Frankly, the quality of the application of the water colour to the paper leaves much to be desired and bears an amateur, untrained or practised approach. But not to a non expert eye. As was the case when our client bought this fake Paul Gauguin work believing it to be a real Gauguin painting. For them it was indeed real and couldn't possibly be a fake Gauguin! A situation where a heart simply got the better of judgement and the simple question, "is it good enough to be by Paul Gauguin," was never even contemplated? Art authenticators and art fraud investigators the Freemanart Consultancy use forensic analysis, academic study & sound investigative procedures to investigate & pursue the authenticity of hundreds of paintings, drawings and prints annually for clients all over the world and not just those executed or claimed to be by Paul Gauguin. Though we are currently working on another major investigation into a possible Paul Gauguin Tahitian work which has recently surfaced in the USA. The investigation procedures now demand forensic, chemical and spectrographic analysis of the pigments and a good look at what lies beyond the paint. A fake Gauguin or a long lost authentic Gauguin is yet to be seen but with forensics, the truth will out? 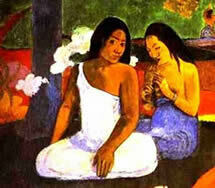 A definitive catalogue & chronological list of Paul Gaugin's œuvres & known works of art. Arranged by chronological date range, alphabetically, defining signature and inscription application & position. Painting - Oil on canvas. Brown oil sketch on canvas. Green oil sketch on canvas. Signature / Inscription detail: Signed P Gauguin and dated 73, bottom right. Housed in a Private collection. Painting Dimensions; Height: 50.5 cm x Width: 81.6 cm. Dimensions; 21.8 x 28 cm. Signature / Inscription detail: Unsigned. Painting Housed with : Ny Carlsberg Glyptotek, Copenhagen, Denmark. The Clearing. (Landscape) Paul Gauguin 1874. Signature / Inscription details: Signed bottom right P Gauguin and dated 1875. Signature / Inscription details: Dated bottom left 75 and initialled P.G. Les usines Cail et le quai de Grenelle - ( Cail Factories and Quai de Grenelle. )Paul Gauguin 1875. Dimensions of painting: 28.2x41.2 cm. Signature / Inscription details: Signed bottom right Paul Gauguin and dated 1875. The Seine in Paris between the Pont d'Lena and the Pont de Grenelle. Paul Gauguin: 1875. Painting Housed in a Private Collection. The Seine Opposite the Quai de Passy. Paul Gauguin: 1875. Viroflay Landscape. Paul Gauguin: 1875. Dimensions; 46 x 33 cm. Signature / Inscription details: Signed and inscribed, lower right: Viroflay - P. Gauguin 1875. Painting Housed: Ny Carlsberg Glyptotek, Copenhagen, Denmark. Key words: Paul Gauguin, Gauguin, authentication, Authenticating, art, artwork, paintings, drawings, prints , fake, fake watercolor, experts, art experts, Tahitian, tahitian women, Tahiti, Vollard, gauguin oil paintings, watercolours, water colours, authentic, signature, ingres, ingres paper, forensic, forensic investigations, paint brush hairs, acrylic.